All JUNIOR players are required to re-register with the WRU this season. Once you have completed the WRU registration you will receive an email which will contain a link which you *must* click to verify the submission. Start the registration by clicking this button. With over 80+ children regularly involved with the junior section of the club we are always on the look out for helpers and new volunteers. From helping with coaching, to ground maintenance, joining the organising committees or simply helping with match day food, all offers of help will be greatly appreciated. Speak to Michael Savage or Nick Larder. All details of how to apply for JUNIOR Club Membership can be found by clicking this button. 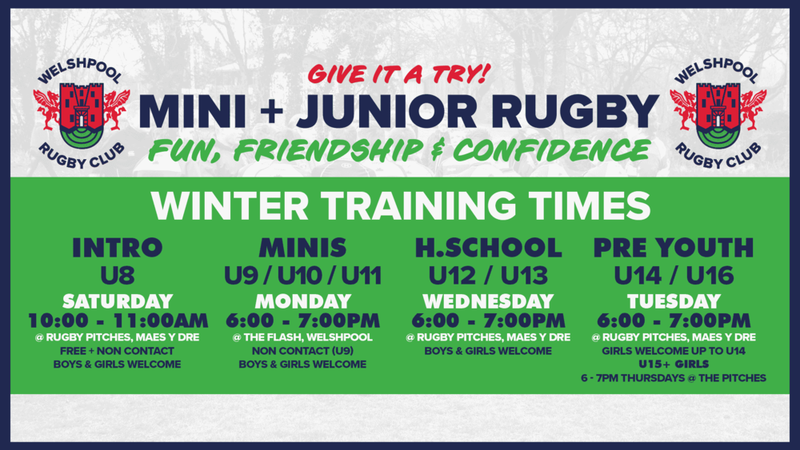 Rugby is a sport that can have a positive influence on children and assist in developing valuable qualities such as leadership, confidence and self-esteem. Welshpool Rugby Union Football Club plays a key role in providing opportunities for children to be empowered so that they develop these qualities. which will ultimately provide a positive rugby experience. We aim to ensure all our coaches are WRU qualified, DBS checked and that there are First Aiders in attendance for all training and match events. Sarah Thomas is the current Welshpool Rugby Club Safeguarding Officer and has lead responsibility for safeguarding issues. She is registered with the Welsh Rugby Union and is supported by the WRU through training opportunities and provided with appropriate advice and guidance from the Club Operations Team (Safeguarding) Advisor.